(MoneyWatch) There was no chance of an "empty chair" analogy in last night's vice presidential debate: Vice President Joe Biden and Rep. Paul Ryan, R.-Wis., sat in chairs at a table facing moderator Martha Raddatz, and the sparks were flying. After covering Libya and Iran, the debate turned to the economy. The first question: When will unemployment fall under 6 percent? Neither could say when, because the bitter truth is that when economies fall into deep balance-sheet recessions like the U.S. economy just experienced, history shows that it typically takes seven to 10 years to recover. Since that would not make a great debate sound-bite, both sides mostly underscored their core economic doctrines, and in a way that was engaging and entertaining. 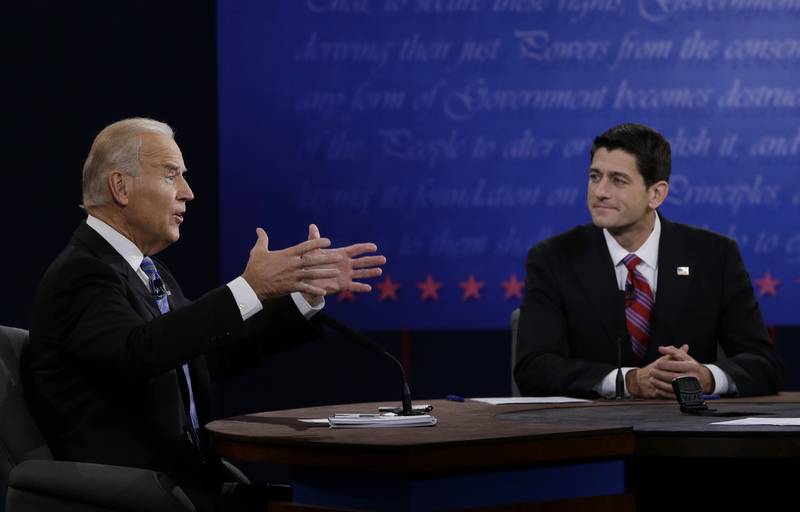 An extra benefit of the vice presidential debate -- the word "malarkey," which Biden used several times in seeking to rebut Ryan, may re-enter the national vocabulary (watch above video). Biden said the Obama Administration came into office when the economy was in free-fall and listed the measures it deployed to turn things around, including: the stimulus; the 2009 rescue of Chrysler and General Motors (GM); and the lowering of taxes for most working families. Unlike during the first presidential debate, Biden also cited Romney's videotaped remark at a recent Florida fundraiser that "47 percent of American who are dependent on government." Ryan acknowledged that the White House had inherited a stricken economy, but said the 2009 stimulus was spent on special interest groups and that the economy should be growing more than the current rate of 1.3 percent. The Congressman also said that under a Romney-Ryan administration the economy would be growing at 4 percent. Predictably, perhaps, the truth lies somewhere in between. The nonpartisan Congressional Budget Office calculates the Obama administration's nearly $800 billion stimulus saved or created more than 3 million jobs and added to economic growth. But most experts also acknowledge the money could have been targeted more effectively. Raddatz said that "Both Medicare and Social Security are going broke," in kicking off the discussion on the federal entitlement programs. The question may have been the only blunder of the night by the otherwise excellent moderator -- Social Security is not going bankrupt. The programs trustees have only said the trust fund will be depleted by 2033. After that, incoming Social Security tax revenue will cover only three-quarters of the benefits scheduled to be paid out through 2086. But slight adjustments in taxes or benefits would be sufficient to eliminate that shortfall, many experts say. It is an overstatement to put Social Security in the same category as Medicare, which is in dire straights. The trustees said the Medicare trust fund, which covers hospital care, will run out in 2024. After that, revenue from Medicare taxes will be enough to cover 87 percent of annual expenses. That share will decline to about 67 percent by mid-century, then rise to 69 percent by 2085. On the attack, as he was for most of the night, Biden said that the Democrats "will be no part of a voucher program [for Medicare] or the privatization of Social Security," referring to the Republican plan to overhaul the Medicare system. Ryan tried to deflect the charge by pointing out that the plan would not change for seniors already enrolled in Medicare and for those ages 55 to 65. Yet for Americans under age 55, the Romney-Ryan Medicare system would look very different from the current system, where the government pays providers on a fee-for-service model. Under the Republican version, seniors would receive a fixed amount of money, also called a "premium support payment," which is what the Democrats call a subsidy or a voucher. Americans would then have the option of using that money to buy a private health insurance policy or enroll in Medicare. If the plan costs more than the fixed amount received by the government, the senior must pay the difference. Additionally, the plan would gradually lift the Medicare eligibility age from 65 to 67 by 2034. The reasoning behind the Republican plan is that seniors will wisely shop for the cheapest plans, and as a result competition among insurers will push down health care costs for everyone. According to the CBO, under the Ryan plan the average Medicare participant is likely to pay an additional $1,200 and $2,400 a year, unless health care costs rise much more slowly. CBO also said that both the Ryan plan and current law could lead to "reduced access to health care; diminished quality of care; increased efficiency of health care delivery; less investment in new, high-cost technologies; or some combination of those outcomes. In addition, beneficiaries might face higher costs, which could in turn reinforce some of the other effects." On taxes, Biden noted that under President Obama's policies the middle class will pay lower taxes and the wealthy will pay more. Ryan correctly noted that there are not enough rich people to tax to significantly reduce the nation's $16 trillion debt. Ryan also said that the Republican tax plan would cut all marginal tax rates by 20 percent, but was evasive when pressed for specifics on how to fund those cuts without raising the federal debt. To date, neither Ryan nor Romney have specified which tax deductions and loopholes would be closed to generate the lost tax revenue. On that point, Ryan was content to reiterate Romney's assertion that "six studies" have debunked the idea that it is "mathematically impossible" to slash taxes, achieve revenue-neutrality, not raise taxes on the middle class and not raise taxes on investments. That claim has come under fire, with some analysts noting that the Romney plan wrongly counts as middle-class income earners Americans who would ordinarily be defined as wealthy.